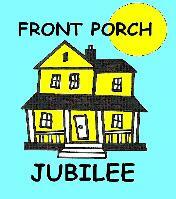 WHAT IS FRONT PORCH JUBILEE? We're glad you asked! Front Porch Jubilee is a ministry that aims to help folks learn about God's love. FPJ hopes to put a song in your heart, make you smile and get you to think. And we hope along the way you get to know your neighbors, your church and yourself a little bit more through the teachings of Jesus and the scripture. WHAT FOLKS ARE SAYING ABOUT FRONT PORCH JUBILEE! Front Porch Jubilee welcomed our church family into the warm, fun environment of an old time radio broadcast. We brought our cares and worries with us into the sanctuary and when we left 30 minutes later we were revived, happy and full of the Spirit. I grinned from the time they got started until they sang the last note! Thank you Mark and Tim. You exceeded my every expectation! God bless you both in your ministry! I wanted to let everyone know about a performance I saw last week at my church that was fantastic! Front Porch Jubilee (or FPJ for short) is a down home, toe tapping good time with its focus on celebrating life as a child of God. New and old believers alike laughed out loud and thoroughly enjoyed the show! The FPJ fellows told stories, performed songs and had sing-a-longs. What I really liked was how FPJ created the feel of an old time radio broadcast complete with a front porch set! It was almost like Andy Griffith meets Prairie Home Companion centered on God's love for each of us there! The two gentlemen behind Front Porch Jubilee are Mark Fallis and Timothy Price. Both are active members of North Springs UMC. If you need a 30-60 minute program that everyone can enjoy (they'll work with you on the length of the show to best suit your needs!) I strongly encourage you to get in touch with Mark or Tim and have them over to your place. I know we'll certainly have them back! I would also recommend this program. Tim Price was lead guitarist for Banks and Shane and I have taken lessons from him. He can play guitar and mandolin very well, which is important, but not as important as the message they deliver. Great show, great people, Greater God! THANK YOU FROM THE FRONT PORCH JUBILEE!